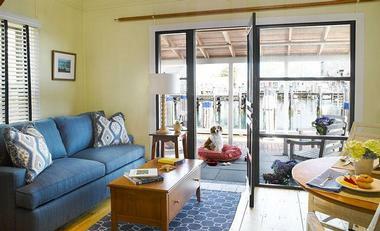 The Cottages and Lofts at the Boat Basin on Nantucket are a grouping of waterfront accommodations, some of which also accommodate pets, about a block away from town. They are located at the Boat Basin, which is easily accessible for guests who may travel in by boat but wish to stay a little longer. 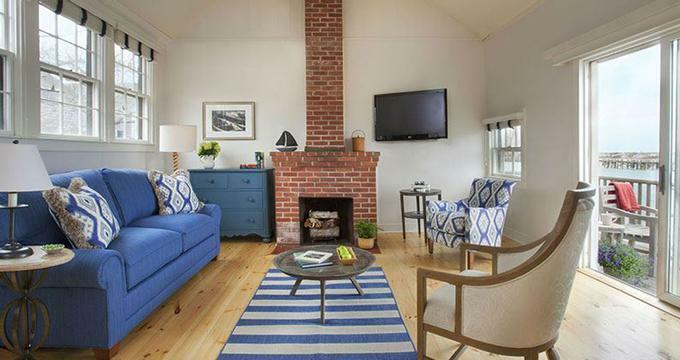 There are 29 studio, one, two, and three bedroom cottages just at the edge of the harbor for beautiful views and a nautical feel. The Nantucket Boat Basin is a unique destination located in Nantucket Harbor and is able to accommodate vessels from 20 to 300 feet. It is a full-service marina and has been awarded many different recognitions for its service and amenities. The Cottages and Lofts at the Boat Basin all feature full sized kitchens, luxurious Turkish towels, robes, and even slippers for guests use. 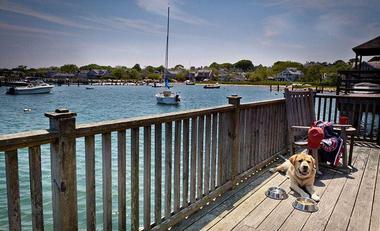 The cottages overlook the harbor, and the lofts are right on the Straight Wharf. 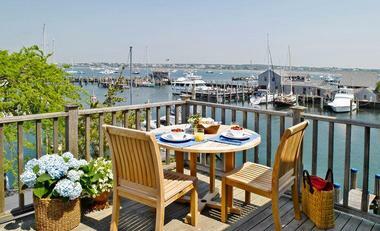 The Crow’s Nest loft is the top choice for lofts and has a view of the entire harbor. There are a variety of cottages and lofts to choose from, including studio, one bedroom, two bedroom, and three bedroom options. These allow for large groups or families to stay together while enjoying complete comfort and convenience. 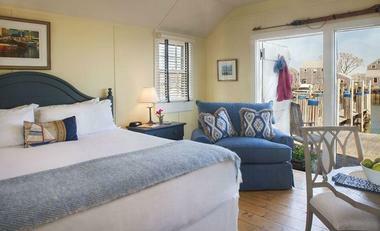 The Studio cottages and lofts feature an open-concept floor plan perfect for singles and couples. The other layouts feature separate rooms to allow for privacy and added space. The decor has a nautical feel and is bright and airy. Guests of the Cottages and Lofts at Boat Basin can enjoy dining at the Brant Point Grill at White Elephant for 15% by simply showing their dining card. This is valid for food purchases only, not alcohol. Reservations can be made ahead by calling the restaurant. In-season, guests could jump aboard the Wauwinet Lady, a water taxi departing the docks of White Elephant, and head over to Topper’s at The Wauwinet for a fine dining experience. Guests who are staying in the Nantucket Boat Basin are entitled to a dining card for 15% off at the Brant Point Grill on all their food purchases. While there is no bar or lounge on-site, there are a few Nantucket bars or lounges to consider. The Grey Lady is a casual bar serving local seafood if guests are looking for a flavor of the local cuisine. It is located on Nantucket Island. If guests would like a bar with a little excitement and music, Muse is a good choice. It is a laid back bar located a short drive away from the resorts with live bands and a dance floor to dance the night away. Meursault is only a short distance away and is an elegant wine and cheese bar perfect for a romantic after dinner drink. It has an old-world charm with stone detailing and a candlelight ambience. At the Cottages and Lofts at the Boat Basin, not only will children receive a kids coloring book briefcase, but they will also have the use of fishing rods, reels, and tackle to enjoy some local fishing. There are designated areas for children to try their hand at angling. If live bait is preferred, there are crab and bait traps located near the office. The cottages are perfect for family vacations since they offer much needed space and extra amenities not often found in hotels rooms, such as full kitchens, dishes, and cookware. Guests can enjoy some of the complimentary services at the Cottages & Lofts at the Boat Basin such as use of boogie boards, beach chairs, and Wi-Fi access throughout the property. Additionally, guests can sign up to board the Beach Bus, which will take guests to many Nantucket beaches as well as local sights or shopping. Included with the bus is beach gear like towels and umbrellas and even coolers. Since The Cottages & Lofts at the Boat Basin is a pet-friendly resort, even pets are allowed on board the Beach Bus. Back to: Best Weekend Getaways from Boston and Best Things to Do on Nantucket.